I mentioned the issues I was having with 6mm shields and decals the other day in The First Decals here in Thomo’s Hole. I will admit that fiddling with decals for 6mm figures shields is giving me the willies. I have therefore been considering alternatives, including filing down the shield boss, to make the process easier. The other day I was at my favourite stationery store here in Singapore and managed to pick up some Japanese manufactured coloured pens, thinking to use those. Today, however, when dodging Singapore raindrops, I passed a little stationery store between here and Raffles Place and ‘lo and behold, they had some neat, paint-filled pens. 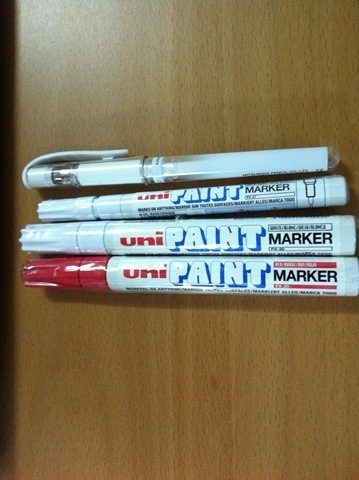 For the princely sum of SG $10.00 I now have a few pens to play around with. I reckon that if the points are fine enough and the coverage good enough, I can draw a reasonable pattern on those shields faster than attaching a decal.